There are few people as magical as Hildi Guiney! A SwellAlumni and empath, Hildi channels her love of nature and spirit into making conscious and energetic jewelry. 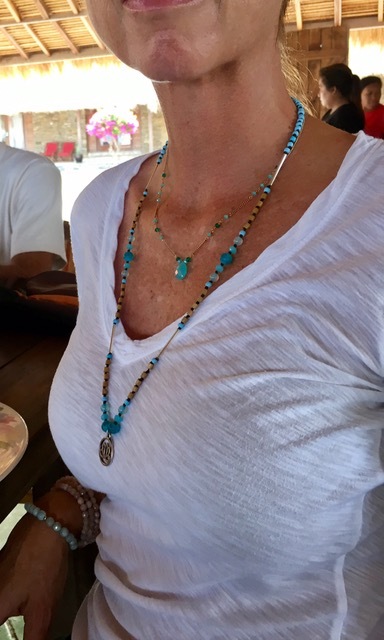 Hildi’s necklaces are all malas, made with coconut beads and crystals which endow wisdom, clarity of mind and energy while amplifying prayers, wishes and positive visualizations. Hildi is particularly fond of the Agate gemstones, which balances the wearers yin/yang energy and helps to faciliate protection, healing and calming the mind. The jewelry’s beautiful exteriors surely match their powerful interiors! 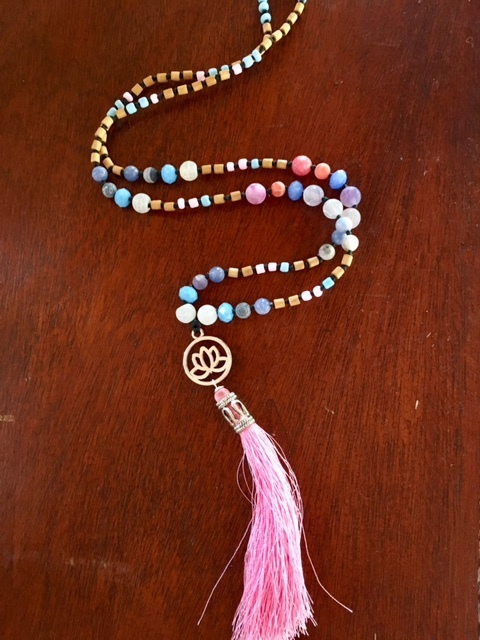 Hildi takes the time to bless and name each of her malas, such as “Swellness”, “Inner Bliss” and “I Have” (for the muladhara ‘root’ chakra). Read on to learn more Hildi’s inspirations, or view (or buy!) her creations on Facebook and Instagram. Q: What’s the story behind you and your passion for jewelry and healing? I grew up as an empath. I would always be aware of different energies, could always sense what was going on in a room, -even before entering. If anyone really close to me came down with a flu I would get it too. Fast forward to when I was 21 I met my future husband, a Kiwi called John, in Bali. I knew even before I met him that “something was in the air”. I fell hard, quit my job and decided to follow him to the end of the world and back. This was in 1995.Someone had told us about Rote so we decided to go and check it out and instantly fell in love with the island and the people. We built a little house here and living so close to nature as an empath is a blessing. The energy on this little island is out of this world! I’ve always been creative and since I gave up my job in fashion I started making jewellery out of beads and shells. I’m also a self confessed beadaholic and it’s been such a buzz making pieces that women actually love. I never make the same necklace twice, my theory is that we are all unique, why shouldn’t our jewellery be unique as well? I love working with crystals and gemstones and the different meanings they provide. If I’m making a piece for someone specific that I have met I’ll always pick the gemstones from the energy that I read from that persons aura/energy field. For me it’s is a real meditative process. Nature always keeps me inspired, gives me strength and who hasn’t been totally blissed out seeing a beautiful sunset and taken time to just sit in stillness and enjoy it? 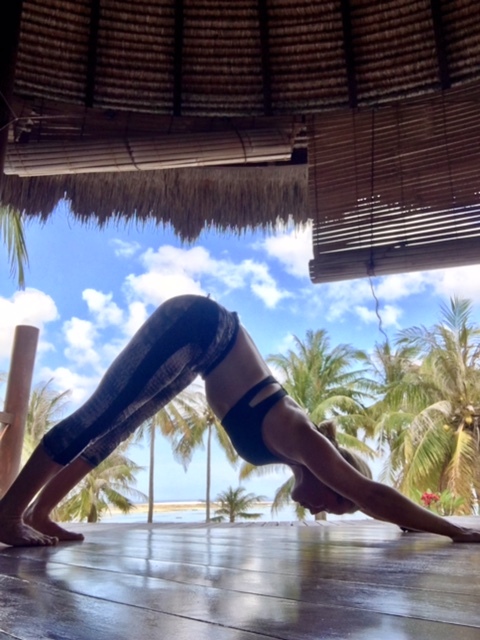 Yoga also makes a deep impact on my life. What do you hope to share with your customers? Life goes by so quick. It’s important to cherish every moment of it. Even the really bad times that seems horrible when we go through them but those are the times that will make us stronger. I love the quote “Once upon a time is right here, right now” make the most of it! Book that retreat, buy those shoes, wear that outfit! Live! My grandmother used to run a summer farm way up in the mountains in Norway and every summer school holidays we used to travel up and help out with the animals and farm. I’m still forever grateful for those summers and the place holds such a magic for me, even to this day!